Don't faint! I have finally posted a picture on our blog! 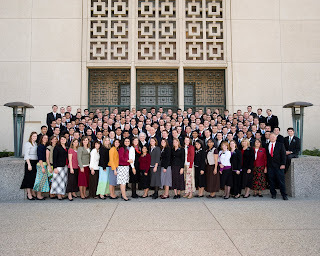 Here are all our missionaries with us at the Los Angeles Temple in December. We have had a new group of 19 arrive and only one leave since this picture was taken. Thank you President Garns (our former Stake President and a professional photographer) for shooting this picture. Thank you Alyssa for talking me through how to get this picture onto the post. We are feeling like we have become the Washington Seattle mission this past week. It has rained for almost four days. Adam is glad Mrs. Claus got a raincoat for him for Christmas. He went the first day with no coat. He thought if there was rain, it would be warm. (In Texas, the gulf air which usually accompanies the steady rains like this is does not make it cold like the Pacific air does here.) He now has the sniffles, but is wearing his coat. Happy Birthday Kindra! She is 29 years young today!!! They are expecting a baby boy in May. That will make 2 girls and 2 boys for the Ronér family. It will also make 11 grandchildren for Jerry and I! This is a great pictures, and wow, you two have a lot of missionaries! It is easy to see why you are so busy. Now we just have to help you get the pictures from your camera onto the computer! Yay for posting though, and I am with Adam - I don't wear raincoats. I finally took a moment to visit your blog and to catch up a bit on your lives as mission president/"mission mom". It has been fun..almost like hearing Gemie talk about things. When you have a second, send me your e-mail so I can e-mail you directly. I still haven't managed to get my Christmas letters out yet, maybe a new version soon. But I do have a blog as well. It is www.hifromsyracuse.blogspot.com. Sis. Martin! You have a blog!I want to add your blog to mine to read about your missionary life!If you email me your email address at s.lindstrom@yahoo.com I can invite you to my blog.